White abortion doctor, Lester Minto who performs abortions in Texas has admitted that he aborts primarily Hispanic babies. ?For 35 years I had a clinic where I saw women and took care of their reproductive needs, but mostly terminating pregnancies,? Dr. Lester Minto says. ?Ninety-eight percent were Hispanics,? Minto toldNPR radio, ?I would go days where I wouldn?t speak English because they were all Spanish speakers ? which is great.? Minto, who says he averaged more than 4000 each year, admits that he has had emergencies related to his abortions. Two of his patients have had to go to the hospital, he says. According to the most recent stats, 64 percent of babies aborted in Texas were Black or Hispanic. 24.9% of babies aborted in Texas were Black. 38.7% of babies aborted in Texas were Hispanic. The stats, published by theCDC , reports that there were 76,778 total abortions performed in Texas in 2010. 23,548 (or 30.7 percent) were non-Hispanic white babies, 19,139 (or 24.9 percent) were non-Hispanic black babies, 29,771 (or 38.8 percent) were Hispanic babies, and 4,320 (or 5.6 percent) were babies of other races or ethnicity. That is an increase from the CDC Abortion Surveillance report published on Nov. 23, 2012. 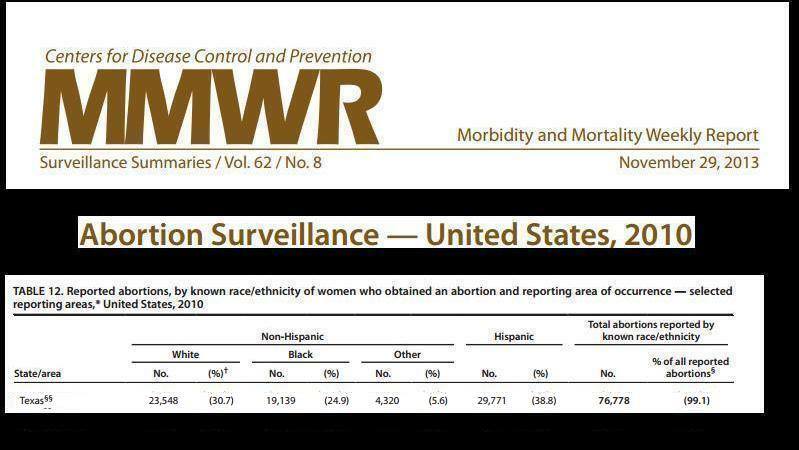 The CDC Abortion Surveillance Report dated November 29, 2013 also reveals that in 2010, 56.7% of abortions reported to the CDC nationwide were done on Hispanic and Black women. According to the Report there were 415,479 abortions for known ethnicity reported for selected states in 2010. 153,045 (or 36.8 percent) were non-Hispanic white babies, 148,261 (or 35.7 percent) were non-Hispanic black babies, 87,240 (or 21.0 percent) were Hispanic babies, and 26,933 (or 6.5 percent) were babies of other races or ethnicity. A Texas pro-life organization says that abortion clinics are strategically located in minority communities. The group, Life Dynamics, Inc. has published a report using zip code analysis to document their claims. Mark Crutcher, president of Life Dynamics, who wrote the report, said that he believes abortion is about eugenics, and his research proves this claim, ?This confirms what we have said all along, that abortion is not about woman?s rights or reproductive freedom it is simply about eugenics. We not only documented the eugenic targeting of minorities in our film, Maafa21 but also in a report we published in 2011. Research we produced for our report, Racial Profiling by Planned Parenthood and the American Abortion Lobby, clearly shows that a majority of family planning centers market abortion to minorities by locating their centers in minority communities.? Crutcher continues, ?Maafa21 cites a study conducted by three American university researchers into the criteria used to decide the placement of U.S. population control facilities. Their finding was that the primary consideration in making this determination is not poverty but the percentage of blacks in the area. Historically, the population control movement?s eugenic efforts have been primarily focused on the African-American community and that was the underlying theme of Maafa 21. In our most recent research, however, we have seen unmistakable evidence that the family planning establishment is also ratcheting up its efforts to deal with the Hispanic population.? Life Dynamics identified 116 ZIP codes nationwide with more than one population control facility. Of those, 84 were disproportionately black and/or Hispanic. Crutcher?s report revealed that in Texas alone, 94 zip codes showed either an abortion facility or a Planned Parenthood abortion-referral clinic located there and 72 percent of the zip codes have populations that are disproportionately black and/or Hispanic.